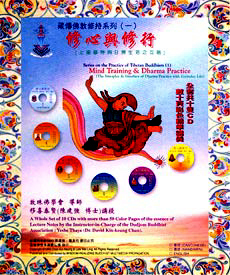 A Whole Set of 10 CDs with more than 50 Color Pages of the essence of Lecture Notes by the Instructor-in-Charge of the Dudjom Buddhist Association : Yeshe Thaye ( Dr. David Kin-keung Chan ). Copyright O 1999 Chan Kin Keung & Law Mei Ling. All Rights Reserved. Published and Distributed by WISDOM-REALIZING BUDDHIST MULTIMEDIA PROPAGATION. Yeshe Thaye ( Dr. David Kin-keung Chan ) started his practice of Tibetan Buddhism at the age of 15. After his early years of schooling in Hong Kong, he went for further education in both the United States and England. He received his two bachelor degrees in Oregon and a master's degree at Stanford University. Later on, he read for his Ph.D. degree at the University of Nottingham in England. In his early years of learning, he received the whole and complete system of the study and practice of Tibetan Buddhism from his Chinese Guru, the Ven. Lama Sonam Chokyi Gyaltsan ( Guru Lau Yui Che ), the Chinese spiritual representative of His Holiness Dudjom Rinpoche in the Far East. In 1972, he received the Vajra Acarya Empowerment ( Dorje Lobpon ) personally from His Holiness Dudjom Rinpoche and was bestowed the Dharma name of Yeshe Thaye ( Boundless Wisdom ). It was in 1986 and in 1996 that Yeshe Thaye was twice requested by his Chinese Guru, the Ven. Lama Sonam Chokyi Gyaltsan, to take up the responsibility of upholding his lineages of Narak Dong Truk ( Karling Zhi-khro ) and of Dudjom Tersar in the Far East. 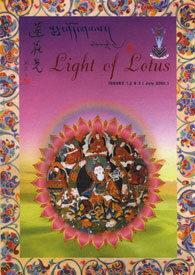 Since 1998, Yeshe Thaye has established the Dudjom Buddhist Association (International) in Hong Kong, and has published the English-Chinese bilingual Buddhist journal "Light of Lotus" ( Pema Osel ). He is now the Instructor-in-Charge of the Dudjom Buddhist Association. Even though he has been personally authorized by Kyabje Chadral Sangye Dorje Rinpoche, one of the most authoritative and realized Masters of Dzogchen teachings of the Nyingma School of Tibetan Buddhism, as the Lineage-holder of the Ven. Lama Sonam Chokyi Gyaltsan, Yeshe Thaye refuses to become others' guru as he insists to devote himself wholeheartedly on his own Dharma practices. Luckily, he is willing to act as the Instructor-in-Charge for the Dudjom Buddhist Association, and thus making this whole series of lectures possible. Whether Yeshe Thaye will follow the footsteps of his Chinese Guru will very much depend upon the Law of the Interdependent Origination of circumstances in the future. 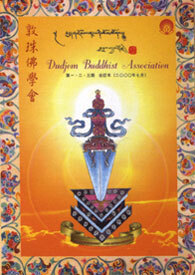 Tibetan Buddhism has a long history of more than one thousand years. Due to the fact that it has many different ways of Dharma practices, with a lot of rituals and ceremonies, it may seem to be exhilarating at the very beginning to the newcomers. But as time passes, some practitioners, whose basic foundations in the Buddhist teachings are weak, or those whose intentions are impure, will soon find themselves becoming frustrated, or to be at a lost as to where they are and what they should accept or abandon. In this way, the more they practice the Dharma, the more they are confused as a result. A lot of questions and problems have been received from both laymen and the Dharma practitioners, who have complained that it is, indeed, not easy to cross the threshold of Vajrayana. Even when they have entered the door of Vajrayana, as it is so full and rich in various arrays of outward fascinations, it is very often that these fascinations distract the eyes and confuse the minds. Hence, the more they go deeper, and enter into the more inner dimensions, towards the center of the Vajrayana teachings, the more questions, difficulties and problems they will encounter, even so much so that distorted conceptions and perceptions of Dharma practices start to arise. All in all, these are long and winding roads with many twists and turns, just like a "maze", and that it is usually more easy to get in but very hard to get out, and is even more difficult to have a holistic picture of what is going on with a sense of direction. How about all those skillful means, as well as the teachings of perfect liberation and enlightenment within a single life-time, as taught by Vajrayana? These are usually all the main "attractions" of Vajrayana, and so what should we do about this ? Particularly, when we are at the moment of death, the "single thought" will determine whether we will be liberated or to continue on with samsara. To be or not to be, that is the question ? Thus, this set of lectures is the first of a series entitled "Series on the Practice of Tibetan Buddhism", the contents of which touch upon the interplay and the interface of the Dharma practice with our everyday life. "All Dharma practices are rooted in life itself", and so how to practice the Dharma, how to maintain our pure intention as well as our pure awareness, in our everyday life experiences will be the main focus of these lectures. Those who are long-time Dharma practitioners will find the materials to be very practical, not to be found in books, and come from the essences of wisdom that flow from real life experiences in the practices of the Dharma, and not just some kind of theoretical knowledge about the Buddhist teachings. Basic concepts, fundamental principles and teachings, as well as the crucial points, distractions, misunderstandings and the pitfalls of practices in Vajrayana will be introduced. As the contents are very condensed and tightly structured, and interpreted in a very special way, there is almost none of such kind of presentation before on the holistic picture of Vajrayana in the propagation of Tibetan Buddhism. Hence, for those who desires to learn about Vajrayana, for those who have not yet correctly mastered the crux of the Dharma practices, as well as for those who have already practiced Vajrayana for years but still have a lot of questions, and would like to review and to consolidate on their Dharma practices, they will all find this series to serve as a useful guide with correct and clear directions. Even for the general practitioners, whether those of the Hinayana, Mahayana, or Vajrayana, this will also provide insightful significance for them. We sincerely invite you all to enter the great door of the practical merits of Buddhism, so as to reorient one's life, to redefine its meaning and to reposition oneself in it. If there are any benefits to be gained from this series of lectures, these will be totally dedicated to all motherly sentient beings, as well as to the three Root Gurus of the author. P.O. Box 44346, Shaukiwan Post Office, Shaukiwan, Hong Kong SAR, China.